As the most celebrated holiday season of the year is just a few weeks left I’m sure many of us have completed their list of gifts for their family and friends. Most of the shoppers are doing some canvassing and searching for the best gift ideas before they venture on a shopping spree because it’s easier to buy things which you know the price instead of just picking up the gifts without knowing how much it will cost. For smart shoppers it’s always fun to have discounts and bargains. Anyway if you’re thinking of nice gifts for the kids especially if he’s a sporty one you can give NFL Jerseys to make them really excited over your gifts. Just make sure you know his favorite team so he can really appreciate the thought. And if you want them to enjoy the jerseys like his favorite players you might as well complete the set. Btw each set of Franklin Sports’ NFL uniform includes 100% double knit polyester team jersey, 100% double knit polyester pants, NFL helmet with logo, foam padding, adjustable chin traps and face mask. He can choose the number that he wants to iron on his shirt, isn’t it great? This is good for kids 4-7 for small size and 7-10 for medium size. 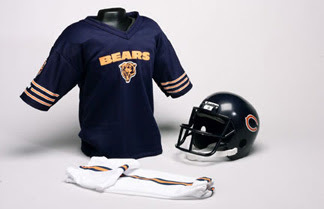 Order them now at www.nfluniformset.com for only $39.99.